Snow, ice and freezing fog caused disruption across Greater Manchester after temperatures dropped as low as -15 in some areas overnight. Drivers were urged to slow down and drive carefully as the freezing conditions continue to cause problems, particularly on minor roads. Travel operator GMPTE warned bus routes may be affected and urged passengers to allow extra time for their journeys. Manchester airport was open, but some disruption to flights took place. This was due to adverse weather elsewhere in the UK and Europe. Passengers were advised to check with their airlines before travelling. The lowest temperature was recorded in Woodford, with a reading of -15. 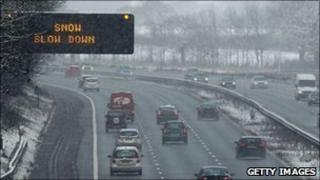 The Highways Agency warned motorists that even without more snow the roads were hazardous. Spokesman Brian Hensby said: "If you're going to work, please be careful, there is a high risk of very icy roads. Use your common sense, please slow down. "People have been driving a little bit fast, the road looks wet but with the falling temperatures the grit doesn't work below -10 degrees therefore there is a risk of icy patches." There were some road closures in the region, including the Woodhead Pass which was closed because of snow and ice. The Snake Pass was said to be just passable. A spokesman for GMPTE said bus services were more likely to be affected on minor roads and housing estates, where the roads had not been cleared. A spokesman said "passengers in all areas of Greater Manchester are advised to head to main roads to try to catch a bus and to allow extra time for journeys, as the conditions are likely to cause delays to services. "They should also, where possible, always check operators' websites before travelling for the latest service information and advice."